Being a successful athlete requires maintaining a healthy diet and routine. And while there is no one-size-fits-all formula, you might be surprised to learn that the techniques the pros use to boost their performance can be just as useful for everyday athletes and weekend warriors. Aramark dietitian Jillian Wanik, DCN, RDN, CSSD, an expert in sports nutrition, filled us in on how the right foods and drinks can help us win at active fun. Q: What does it mean to eat a balanced diet and why is it important? A: Think of your body as an engine. With the wrong blend of fuel, it won’t perform at max capacity. That’s why you need a balanced diet with the right blend of carb, protein, and fat – all key to maximizing your performance. Eating a variety of fruits and vegetables balanced with lean proteins, whole grains and dairy foods is a good start for most athletes. Q: What are the best carbs to fuel muscles? A: Carbs provide energy during exercise and replace stored energy after exercise, so it’s a good idea to include carbs in your meals and snacks. Some of the best options are whole grains including breads, cereals, crackers, pasta and brown rice. Fruit is another quick and easy carb source that can be eaten fresh, dried or canned in water. If you eat dairy, reach for milk, yogurt and cheese. And lastly, don’t forget vegetables and beans! They are also good carb sources. 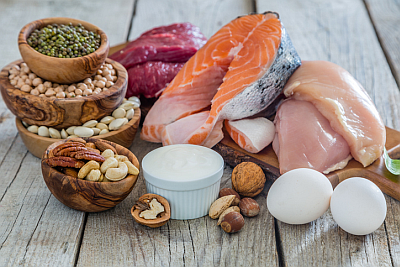 Q: What are the best sources of protein? A: While protein typically does not provide fuel to muscles during exercise, it is the building block for muscle and key to strength building. Protein also promotes muscle growth and repairs muscle damage after exercise. Some well-known sources are lean cuts of meat or poultry, fish and eggs, and dairy foods like milk, yogurt and cheese. But don’t forget that plant-based sources like nuts, seeds, beans and soy work well in this category, too, and can actually take the lead as your main sources! Want to learn more? Sign up!